There's a strongly worded letter being penned and it's addressed to the Oxford English Dictionary. 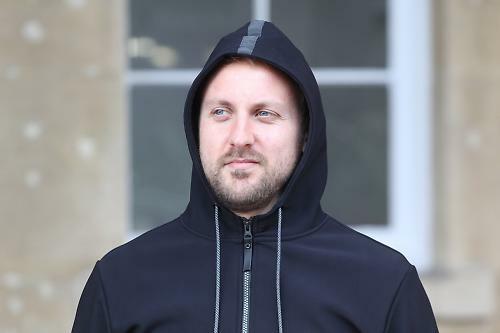 It tackles the important issue of the lack of a word in common parlance to describe the hoodie-jacket hybrid that's becoming increasingly common in active outerwear. It's part hoodie, part jacket – a 'hooket' if you like. The latest 'hooket' to land at road.cc towers is the Softshell Sweat Hood from Huez*. 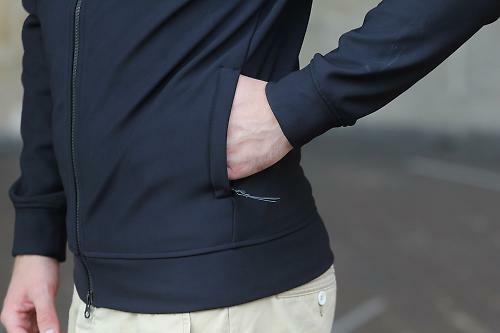 The Softshell Sweat Hood is part of the 2015 range of urban gear from London-based Huez*. The brand is known for smart and stylish apparel, aimed for fashion conscious cyclists that want to look good on and off the bike. The Softshell Sweat Hood doesn't just look the part, it's also integrated with performance technologies that make it stand apart in an increasingly crowded market. Huez* say: "We visualize a world where modern sportswear is so enriched with technology, that people are able to live in style and be more healthy than ever before". Sounds great doesn't it? 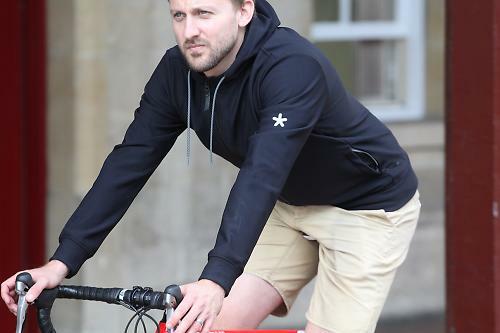 The Softshell Sweat Hood is specifically designed with the about town commuter in mind, to be worn either with civvies or more relaxed cycling gear. The kind of jacket you can grab to ride to the shops or the pub and not feel out of place when you arrive. It's got a blend of style and underlying performance that work together nicely. The Softshell is largely made of a nylon/polyester mix with a bit of elastane thrown in for flexibility on the bike. It's water-repellant to a pretty decent level. It'll withstand light to medium showers with the water droplets visibly beading and running down the surface. The protection against the wind is good and it's got a fairly good level of breathability, although it's not the first thing I'd grab if knew I was going to be getting warm in the saddle. The soft fleece-like lining is really comfortable but does tend to warm up quickly, although it does provide a nice bit of insulation in nippier weather. The fit of the jacket is fairly relaxed, the arms are long enough that your wrists stay covered when reaching for the bars. The cuffs and the hem have wide elasticated bands that keep them fitting snugly, but a little too tightly in the case of the waist. The waistband seems disproportionately tight compared to the rest of the jacket. It pulls in very slim when off the bike and on the bike it starts to ride up with the pedalling motion. Every time you stop at a red light you have pull it back down; pretty annoying. The jacket is fairly minimal in terms of features. There's a zip running down the length of the front, it has a double zip allowing it to undo from the bottom for extra ventilation if desired. 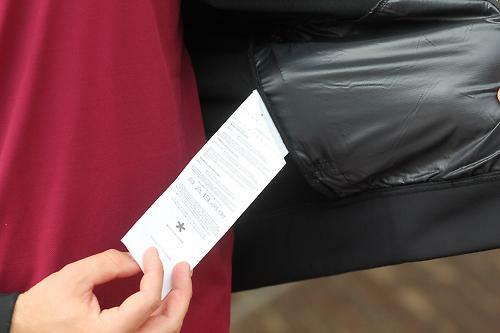 There are two front zipped pockets and a reflective Huez* asterisk on the sleeve. All the zips on the jacket are Aquaguard YKK zips, designed to keep out the elements, and the pocket linings are made for ultra-light and tough ripstop material. The Softshell Sweat also has a hood, handy off the bike and on the bike if you ride without a helmet. If you're riding with a helmet it becomes fairly redundant, as it's too bulky to wear under a helmet and won't stretch over the top of one. 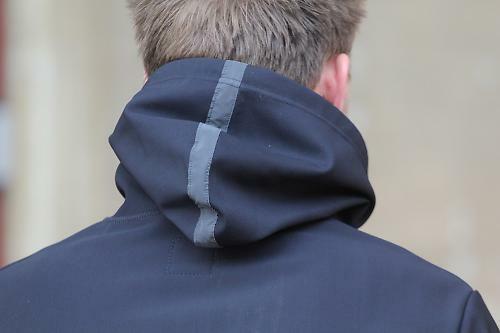 A strip down the back of the hood and the drawstrings feature Huez* Darklight technology, a material that appears black in daylight but becomes highly reflective in low light. That's a really nice feature as it's totally inconspicuous when off the bike but lights up up like a Christmas tree at night. Generally the jacket performs well on and off the bike, it really looks the part and can withstand the elements, but the fit around the waist is its main downfall. Another minor niggle is the size of the label, a common feature across the Huez* range. It's just too big, long enough that it can flap out from under the jacket and look quite unsightly. It just seems strange for such a considered garment to have such a clumsy answer for a label. The Softshell would definitely find the most use in the spring/autumn conditions, it's just a bit too warm for summer riding conditions. It's available in the just the one colour option and is available in sizes XS - XXL, 34in to 44in chest sizes. The jacket retails at £185, not surprising really Huez* are a premium brand and that comes with premium prices. It's a solidly performing and well made jacket, but the fit around the waist is a sticking point. If you're forking out this much for a piece of kit you want it to be as near to perfect as possible and the cut is a fundamental flaw here. The Softshell Sweat Hood is a out layer designed for using on the the bike and off it. Comfortable to wear and ride in but with well designed techincal functions. 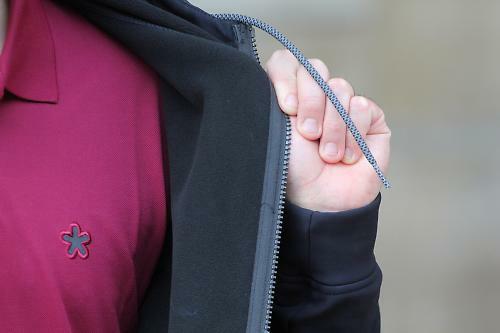 Huez* say: "Our softshell sweat is made from a multi faceted material capable of providing the utmost water repellency, whilst remaining breathable and comfortable. Cut in a classic shape with two zip pockets with rip stop lining. Our hoody has our discreet Darklight reflective tab running down the center seam and is finished with reflective pull cord at the neck." Well made, tough and well thought through. The only design snag would be that the waistband is too tight. Performed generally well, the tight waistband really let it down on the bike though, too tight and kept riding up, it became quite an annoyance. Tough and durable, no signs of wear during the review period. Generally conformtable...apart from when the waist band rode up during riding. Off the bike it works well, and the features are all there, it just needs to fit properly on the bike to justify the high price tag. Generally well, the features are all useful and well thought through, but the fit of the waistband just overshadows it. The Darklight material is impressive as was the water resistance and the comfort. You guessed it, the waist band when riding. Did you enjoy using the product? Partly. Would you consider buying the product? No, not until the waist issue was addressed. I'm giving it a 6, it's a good jacket but just not quite there. Riding comfort has to be the priority and the waistband is too much of an issue to ignore. However, many of the other features work really well, so it has the potential to be a really great jacket. I am increasingly convinced labels like that are there to annoy you into cutting them off & keep you from returning things. Anyone else go looking for a footnote when they starting reading this ?